I’ve moved this blog! Please update your links. If you are subscribed to the blog and are getting this posting, then you are using the OLD feed. My new home page is http://www.sciencegeekgirl.com. And if any bloggers have had the experience of moving your site and your feed and have some tips for getting back the google juice and maintaining subscribers, please let me know! Ths blog has moved! Click here to see the whole post. OK, I’ve been posting everybody else’s YouTube videos, so what about METube? After all, it’s all about me. Here’s my latest Science Teaching Tips podcast — As any teacher knows, the ability to ask good questions — and use students’ questions — is a valuable skill to have in your teaching toolbelt. In this podcast, TI staff biologist Karen Kalumuck describes how she tries not to answer every question that’s asked during a class, however tempting it may be. Instead, she’s learned how to guide her students to discover ideas for themselves. Episode 66: That’s a good question! Want to learn to podcast? Sorry for the lack of posts lately — I’m on the verge of porting the blog over to a new location, and holding off on posting so that I don’t have to re-post after I make the move while I’m in this limbo state. So, stay tuned for the unveiling of the new location! For those of you in Boulder or Denver– are you interested in learning about podcasting? We’re pulling together a small group of people (mostly writers) who would like me to teach them a little bit about why to podcast, and how to go about it. The cost will be lower the more people we’ve got, and we’ll tailor the workshop (and its length) to the needs and desires of people in it. So, if you’re curious, this is a great way to dive in! Contact me at riggmail-geek (at) yahoo (dot) com. I’ve also run some workshops for K-12 teachers on listening to, using, and making podcasts in the classroom, if anybody has an interest in that workshop. Everybody’s favorite — microwaving a lightbulb. Pretty! At least two posts suggest that if you put the bulb in a mug of water (with the bulb part sticking up) then it won’t explode. I believe that’s because the water acts as a dump for the microwave energy, keeping the bulb from heating up out of control. What’s going on? This is similar physics to two of my previous posts (microwaving a CD, and the microwaving a grape post). Lightbulbs are a partial vacuum inside, but also have a small amount of gas, usually Argon. The microwave makes a current in the metal of the bulb (just because microwaves push charges around). This current lights up the filament in the light bulb. But it doesn’t glow in the way that you’re used to seeing a lightbulb glow because the high voltage creates a plasma inside the lightbulb (remember, this is an ionized gas), and the gas glows purple. I’m pretty sure that this doesn’t require the lightbulb filament — in other words, this should work with a burned out bulb. The light pulses because the magneton that creates the microwaves in your microwave oven is pulsing on and off. I’m not quite certain why there are the different colors created, though it seems to be related somewhat to the rotation of the bulb in the microwave. It may simply be that at different angles, the lightbulb acts as a stronger or weaker antenna for the microwaves, creating more or less voltage, and thus a plasma that glows at different colors as more or less energy is dumped into it. I never found a good comprehensive site with a succinct explanation, but this page has some interesting discussion. This is actually what normally happens in a regular fluorescent tube light (that is, an ionized gas glows), so if you put a fluorescent tube light in the microwave, it should glow like normal. His favorite, he says, is the giant mercury lightbulb. Hey all you bio-babes (and bio-boys) out there, wanna give us some feedback? A good friend of mine is a biologist and science writer, and is starting a new blog. No, you can’t read it yet, it hasn’t begun, but she’s searching for the “killer app” of a name. She’s got some ideas, below, and I thought perhaps some readers here might have some feedback or ideas! I want my blog to mostly be a humorous look at unusual/interesting/beautiful living organisms, but also to include biology and science in general, with a sprinkling of psychology, archaeology, linguistics and popular culture. “A blog about the weird wonderfulness of life” is my working tag line (or should it be the wonderful weirdness of life?). Here are some title ideas. Love ’em? Hate ’em? Of course, we can’t dare to compete with the lovely simplicity of Bioephemera, but we can aspire to some lower level on the nomenclature food chain. Thanks in advance for any suggestions or feedback on favorites! And another really pretty one (gotta love the Darth Vader-esque breathing in the background), with an extra bonus: aluminum foil! You can play around to see if it matters if there are images on the CD, if it looks different printed side up or shiny side up, etc. This site claims that it works best label-side up, and that the less ink on them, the less they smoke. As you know, it’s not supposed to be good to microwave metal. That’s because the microwaves can push the electrons around in the metal. (Electrons in non-metal, or non-conductive material are kind of glued in place, so they can’t be pushed around). That can make the metal heat up (just like a metal wire will heat up when it’s conducting a current) and do all sorts of bad things to your microwave. You can read more about microwaves and what they do to metals here. Some of the islands will be shaped so that they make very good microwave antennas. These spots will focus the microwave energy, and get very hot. Now you will see just a few bright spots spewing a lot of smoke. The good part of the light show is over, turn off the oven. Here is a lovely image of a CD post-microwave, showing beautiful fractal trees where the electrical arc made its way across the aluminum. I’m still a little confused as to why the patterns burned in the CD follow these circumferential patterns. I imagine that the CD data is originally etched in circumferential patterns, making the aluminum thinner in these regions, and thus channeling the electricity in these circles. 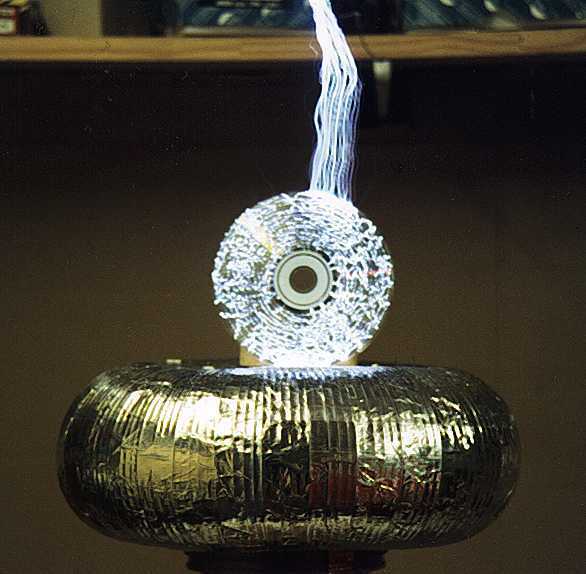 For extra fun, if you happen to have a Tesla Coil lying around, here is what happens when you place the microwaved CD on top of the Tesla coil. I got this from ElectricStuff.co.uk, which has even more pictures. I believe what’s happening is that the electric current from the Tesla is flowing just through the parts of the CD that still have aluminum on it, generating high heat and arcing in lovely patterns.